The convention center's suggestion to homeeschoolers. This past weekend, I spoke at the California Homeschool Convention, which is one of the Great Homeschool Conventions. 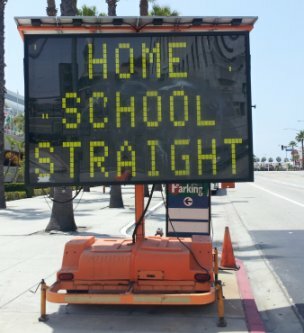 Many home educators attend conventions like this one to get advice from various “experts” on homeschooling, and for this convention, it seems that even the convention center where the event was held wanted to put in its two cents. The facility put out the sign shown on the left, and it was the first thing most people saw as they drove into the convention center. Obviously, the advice is sound, and I hope that the attendees took it to heart! I gave a total of six talks at the convention, and most of them were for the teens. However, there was one, entitled “What Are They Doing Now?“, that is specifically for the parents. The talk focuses on homeschool graduates and what they are doing with their excellent education. First, I share some statistics, such as the fact that homeschool graduates are more likely to have college degrees and more likely to be in college than their non-homeschooled peers.1,2 I then turn to a discussion of some individual homeschool graduates who are, literally, making the world a better place. The homeschool graduates I talk about are all doing amazing things. For example, one is a medical doctor and bioethicist, another is an undercover operative for an intelligence agency, and still another is part of a non-governmental organization that is making better nutrition available to those in third-world countries. Many of them have impressive degrees, and many of them skipped university and started making a positive difference in the world right out of homeschool. One of those who started changing the world right out of homeschool is named Sydnee. At the ripe old age of 17, she felt the Lord leading her to an orphanage in Monrovia, Liberia. This was not part of some organized trip, and she didn’t know anyone there. She simply felt the leading of the Lord, convinced her parents, and ended up going to that terribly dangerous country because she wanted to help those who had no hope. The orphanage specialized in adopting these children out to parents in developed countries, giving them a chance for a safe, happy life. Sydnee thought the Lord wanted her to be a part of such a life-changing ministry. I then go on to say that in many ways, this young lady is more impressive than the others who have advanced degrees and are leaders in their field. I can’t even imagine wanting to go to Monrovia on a short-term missions trip, surrounded by familiar people and comfortable in the knowledge that someone had thought through all the details associated with such a trip. Imagine a 17-year-old traveling there on her own and immediately impacting the lives of children like that! Well, at the end of the talk, the young lady who was recording the session came up to me and told me that her family had worked with Sydnee to adopt the two African children that they have! Most of those who heard the talk were still in the room, so I raised my voice and told everyone what this young lady had told me. One of the attendees actually sat back down in her chair and wept tears of joy. Even though we were thousands of miles from Monrovia, we were able to share in the blessing that Sydnee had helped to bring to others. This is what home education produces. It produces amazing graduates who do incredible things, including looking after orphans in their distress (James 1:27). I can’t tell you how wonderful it is to work with people like that! 1. Cogan, Michael F., “Exploring Academic Outcomes of Homeschooled Students,” Journal of College Admission, 208:18-25, 2010. Thanks for sharing this Jay! It shows that you can never out give the Lord. I loved this talk when you presented it for my expo and it was one of the favorite of the listeners as well. Sounds like you were Homeschooling Straight! Felice, it is also my favorite one I give right now. That’s such an encouraging talk, Jay! I’m so glad you are giving this talk regularly. There are so many more homeschoolers homeschooling through high school. This year, our homeschool group held its first graduation ceremony ever with 20 graduates (Heather was one of them!) Talks like this encourage more to stay the course through high school – that’s when we really see the pay off. Thanks, Jeannie. Congratulations to you and Heather. Thanks, Janice. I think most of the people who have that worry know very little about homeschooling. Wonderful story, Jay! Thank you for sharing it. During the summer of my Junior year at Bryan College I went to Monrovia, Liberia. My parents thought I was crazy. I had the privilege of teaching Bible in the government run schools for nearly 3 months, and fell in love with the children. Some of my students were taller than me because their schooling had been delayed due to illness with Malaria or having to work out in the Bush (jungle) raising crops. When I came home, I felt a little piece of me stayed there in Liberia. What joy to hear of Sydnee’s courage and obedience to go where God called her to go! Thanks for sharing your story, Jackie!